This morning when I headed out to school, I stopped in to check on the one of the squares that is filled with bleachers and chairs. There were a number of people walking the rows - wiping down seats and picking up trash. When I got out of class and returned, almost four hours later, there were only two people left cleaning the bleachers. I liked this guy who was using a leaf blower to clear out the last bits of debris under and between every chair. They really do a lot of cleaning each early morning but one thing that they don't manage to clean is the wax that covers the streets where thousands of Nazarenos have dripped from their candles. This is just the street between our house and the bridge. The streets down near the cathedral are like sheets of wax. It makes the cars sound very funny on the road, and I imagine breaking feels very different. This evening I only went to see a couple of hours of processions, I wanted to get home in time to pack for Budapest before going to bed since I am leaving directly from class tomorrow. One that was very interesting was the one that starts and ends not at a church but at the main building of the University of Sevilla. It has two pasos which were both beautiful. The "Christ" pasos are all very different and often depict part of the story of the Passion, but to me the "Virgin" pasos are very similar. They are still beautiful, of course, but I have a hard time telling many of them apart. Of course many of the locals have their favorite versions of the Virgin and to them they are nothing alike. One thing that I found particularly interesting was that the Nazarenos for this procession walked in groups with each group carrying a small identifying banner and unlike some of the processions the banners didn't have names like "Nazarenos del Santisimo Cristo de la Fundacion" but instead had names like "Facultad de Ciencias" (Department of Science) and "Facultad de Farmacia" (Department of Pharmacy). This is, of course, a Catholic exercise, but it was interesting to see so many people identified by their roles at the university coming together to form a brotherhood of nearly 1400 Nazarnos. It is just one more example of how the overwhelming majority of people in Spain identify as Catholic (not always practicing Catholics, but Catholic nonetheless). Tomorrow we head out to Budapest. Hopefully we are able to navigate without much trouble to the airport. It will be fun to see how the city has changed in the years since we lived there. The first procession started at 11:30 this morning, but didn't make it to the center of town until around 4:30, so when I got out of class at 12:30 the folks were just starting to reset the chairs and barriers. I did notice this woman with A LOT of sandwiches! Not sure if she is feeding a church group or just taking them somewhere to resell or what. Lots of businesses that don't normally sell food and drinks are selling pre-made sandwiches and cold drinks this week. With the tens of thousands of people in the streets, I guess it makes sense. When I got home, Albert and I went out and found a gym for him for the rest of our time here - a good chance to practice Spanish. Then grocery shopping (may not even need to go again before our trip to Budapest) and finally a trip over to pick up a new watch band. This afternoon, I stayed in and did my homework and some studying and then Albert and I watched a bike race on TV. 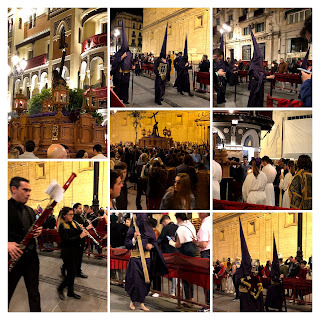 At around 8:00, I headed out to watch some of the evening processions. They are really pretty with the candlelight, but I couldn't get a good picture to capture one. The streets in the center of the city were just walls of people. If you don't like people in your personal space, this would be a very disturbing event for you. You are basically chest to back and arm to arm for blocks at a time. But, I found people to be pretty polite and had lots of short conversations with folks as we all made our way to different processions. Of course, I really like the bands. But, I watched a silent procession today that was very beautiful. I was impressed with how respectful and silent the crowd was as it passed. Getting home was not easy since lots of streets were blocked with processions (which can take up to a couple of hours to pass), but luckily I am pretty familiar now with the city and only had to go about a quarter of mile out of my way. It was a beautiful night, so I was able to just enjoy the walk. There was a serious taxi line at the bus station (maybe 100 people). I am not sure where they were all going, but I am glad to have been on foot. It is almost midnight now and tonight's Triana procession is just starting to make its way through the neighborhood, I can hear the drums. 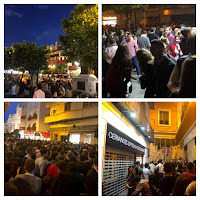 The last paso is scheduled to enter the church at around 2am. When I came in, there was a pretty good crowd on the bridge and lining the road, but our road was clear. Now, off to bed so I can be sharp (or at least not totally dull) for class tomorrow morning! It is Palm Sunday - the official start to Semana Santa (Holy Week). There are many Catholic countries in the world with elaborate Semana Santa celebrations - Brazil for example. 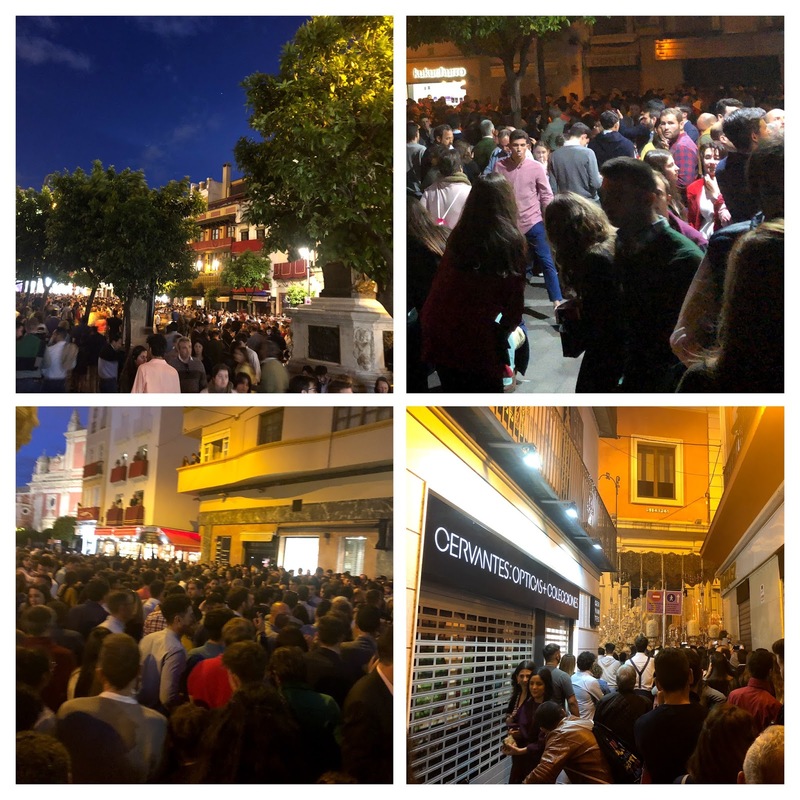 Although Spain is a pretty Catholic country, Semana Santa is really celebrated in the south of Spain, and nowhere like Sevilla. With brotherhoods dating back to the 1300's and art and traditions nearly as old, this week is like a trip through the centuries. 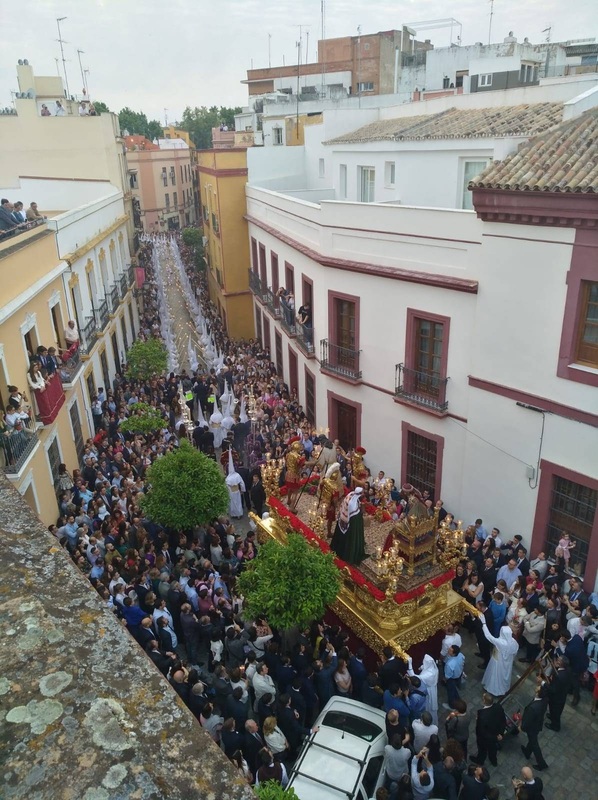 Speaking of balconies - if you happen to have one along one of the procession routes, it is a great place to get a full view of one of the many pasos and the long lines Nazerenos. A classmate sent this picture today of the view from her balcony. The white lines are columns of Nazerenos in white robes and hats each holding a long candle. I am finally to the point that when I see a Nazareno, I think Nazareno and not KKK. There are thousands of them. Of course they are in the processions, but they are also just around... on our street, for example. This little Nazareno (Dad is holding her hat) is on her way to the start of the procession in Triana. In the background an adult Nazareno is just getting out of the car. These two were waiting for the crosswalk signal. And this group was taking a short break in Plaza Nueva. One part of the processions that has changed over the centuries is the music. It used to be that the processions were all silent or with only a sad, low trumpet - some are still silent. Later, choral or chapel music was added and in the 19th century, some brass bands were introduced. Early in the 20th century, some of the melodies became more festive - the marches have stayed pretty much the same since. 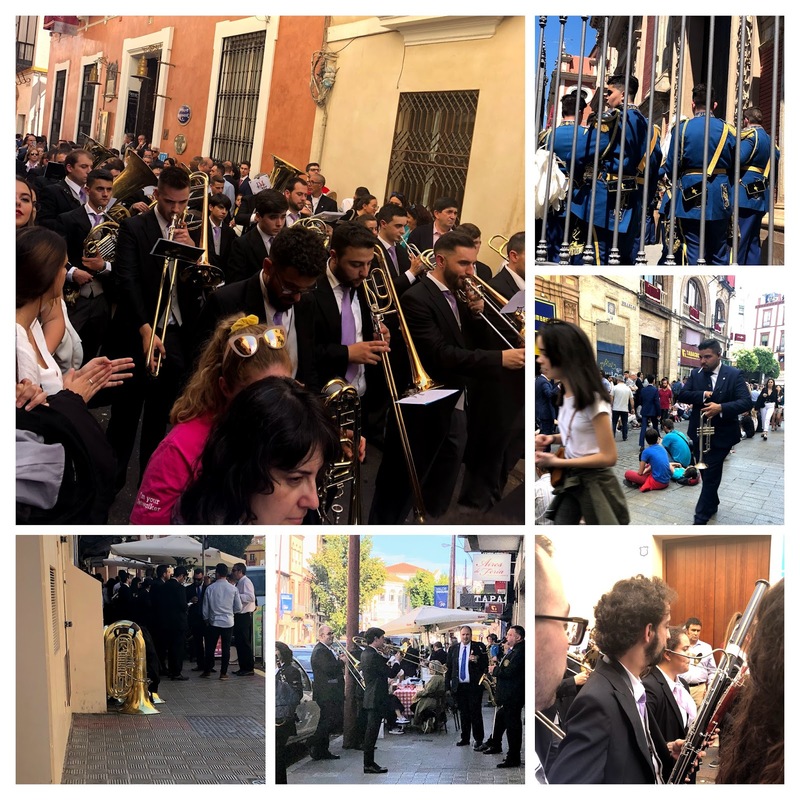 The gold "Christ" pasos will have drums and brass if they have a band and the silver "Virgin" pasos usually have a full marching band. As well as long processions, there is a lot of waiting around if you are a band member. And with today's temperatures in the 80's it was a great day to be out watching, but maybe not ideal in your wool band jacket. 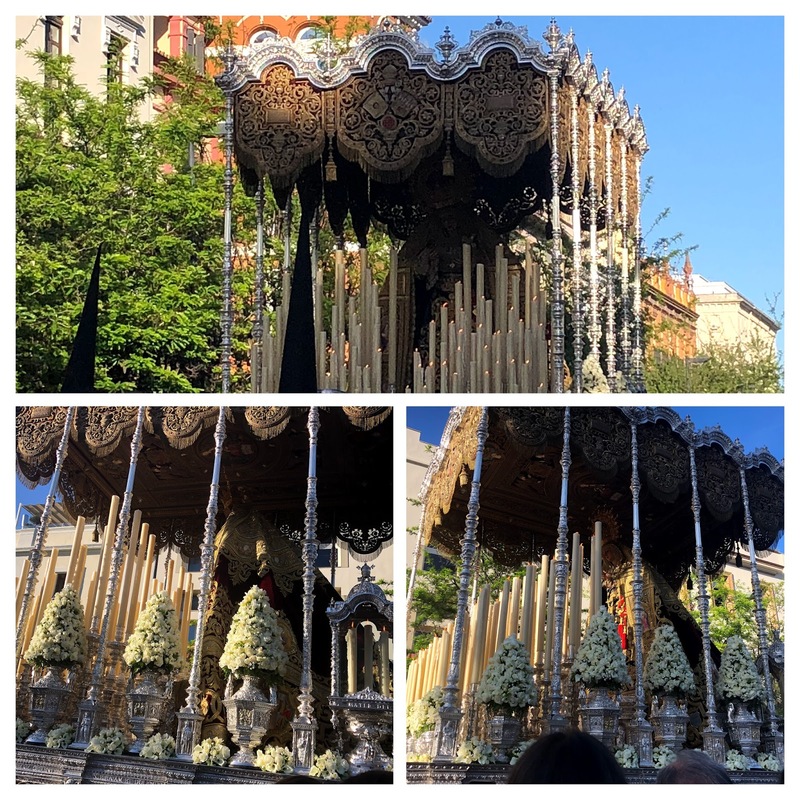 This morning, all of the chairs were set - by this afternoon, the seats were packed with their ticket holders, and the streets that were expecting processions that were not full of chairs were packed with people as well. I added to the crowd... and enjoyed every minute of it. I know lots of people don't, but I love crowds. And the pasos really are like little museums filled with incredible works of art. The crowd was silent as this one emerged from the church and then broke into applause at is cleared the orange trees (the palm tree is part of the paso.) The Christ sculpture is from the 17th century. Of course, the streets away from the procession routes are actually emptier than normal...I even found an empty sidewalk. The processions are still going, but I am off to bed. Since the streets in the center of town are basically impassable in the afternoons, my class has been moved to the morning for the week (Monday - Wednesday). Everything is closed Thursday and Friday. 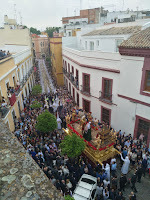 This afternoon, the processions are all pretty far from Triana. So, I decided to skip the crowds and just run a couple of errands. This morning, Albert and I went grocery shopping and then looked around for some gyms close to our house - the idea is to actually go in and investigate on Monday. Then, this afternoon, I headed downtown to exchange some money for Hungarian Forints so that we will have a little cash since we get in a little late Wednesday night and it will make bus tickets and small purchases easier without having to find an ATM right away. Hadn't laid eyes on a Forint note since we left Budapest almost 16 years ago. For the rest of my walk, I just enjoyed the normal things happening in the city. The lottery ticket sellers on all the big corners... and some of the small corners. And the tourist buses and boats. This evening, the big cross town rivalry professional soccer match "Sevilla vs Betis" was scheduled for 8:45; so I made sure to make it home in time to try to find it on TV. Sadly, it wasn't showing on any station that we have - there was radio coverage, but I didn't invest two hours listening to a soccer game on the radio,.. I mean I would have watched, but I am not THAT invested. Sevilla ended up winning 3-2. Tomorrow is Palm Sunday - the official start of Holy Week. There is a local channel that has live video of all of the processions.... probably won't watch much of that, but there are two of the nine processions tomorrow that have been pointed out (either by our landlord or someone at school) as being especially interesting, and I plan to try to see one or both of them live. The weather today was pretty much perfect - almost 80 degrees, sunny, and a very light breeze, tomorrow is supposed to be a little warmer but otherwise the same. Hopefully it holds out for a least a few more days. 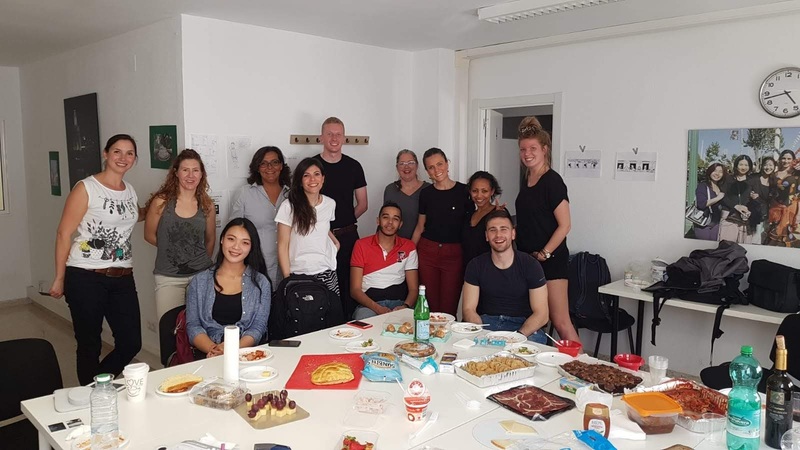 Today was the last day for a couple of students, and lots of people will not be at school next week including our regular teacher....so we had a bit of a celebration. There was lots of food (I made turtle brownies with the turtles from earlier in the week, Challah Bread, and a small batch of M&M cookies.) There was wine and eggplant Parmesan and salad and lots of other food. I am pretty sure that nobody went home hungry. Lots of business (and even residents) with balconies in the center of town rent out their balconies for the week to visitors or groups who want to watch processions from above. These will all be full on Sunday! The chairs are starting to be unfolded and kids are enjoying this short window of time when the seat boxes are erected but not yet ready for their occupants. I don't exactly understand it, but I do appreciate the passion and commitment and the beautiful art. Although Holy Week doesn't officially start until Palm Sunday, there are some smaller neighborhood processions starting tomorrow evening. The people that will sit for hours watching the large processions make their way to and from the cathedral begin on Sunday evening - but tomorrow, 5 short processions and Saturday 5 more will make there way through the neighborhood streets of the sponsoring brotherhoods. Tomorrow, of the five, there is one near my school and one here in Triana that both start at 8pm. So, my idea is to stick around after class to try to catch a glimpse of the one near school and then make my way home and try to see the one in Triana before it ends. They are both small with only about 100 Nazarenos and 1 Paso each but they are each scheduled for between 4 and 5 hours - so I am thinking that I should be able to catch a little of each. In celebration, we are having a small party at school tomorrow. The plan is to start class a little early and then cut the break a little short so that we can all get out a little early - in time to watch processions if we are interested or to get off the street and away from the crowds if we are not. I have done some of the prep work tonight so that I can bake in the morning and get to class on time. Speaking of prep work. The crews were out in full force today to start getting the chairs out for the rest of the "common route". 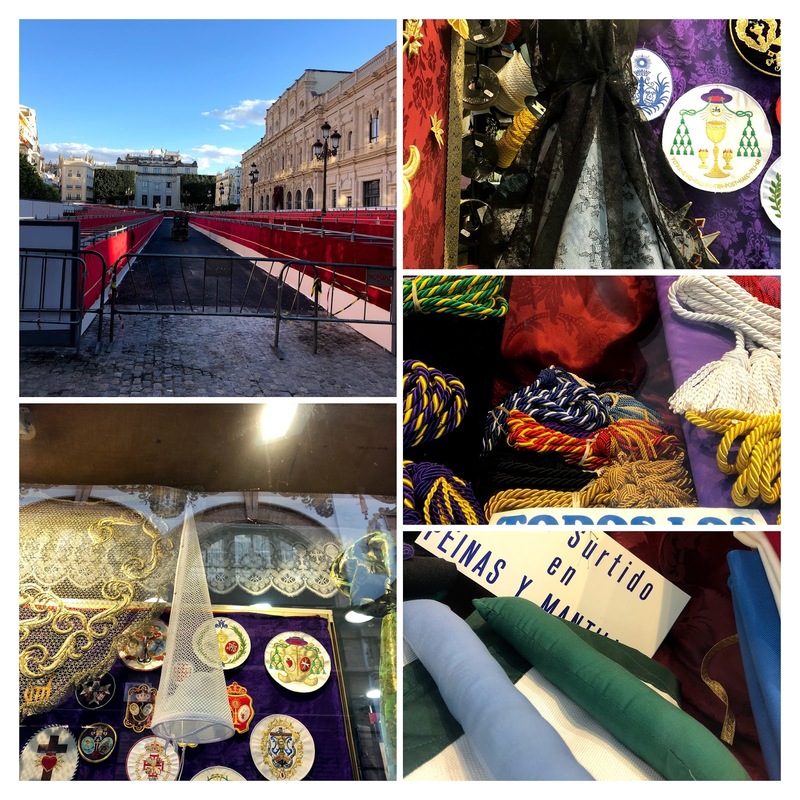 The idea is that every procession is carefully scheduled to parade from its home church to the Cathedral of Sevilla and then out and back (along a different route) to its home church. There is one section of a little over 1 km that every procession will travel either on the way to the Cathedral on the way home. Viewing in this section is done almost exclusively by people in rented seats (the seats are sold for the whole "season" (week) and people may choose each year to buy their seats from the previous year - some families have had the same seats for generations). They are not cheap, but they do allow viewers to see every procession without having to fight crowds to get from one street to the next. Don't even think of bringing your own chair and trying to find a spot between the bleachers near this part of the route - it is prohibited. The tram that normally runs in front of the cathedral has been shortened to account for the procession route as well. So far, no rain in the forecast for the next few days.... fingers crossed. This morning I tried to make Turtles, sadly the caramel was a little softer than I wanted - so tomorrow I will make them into Turtle brownies...so not a loss, but a disappointment. 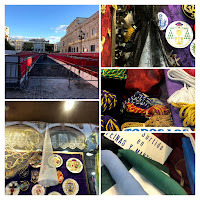 After school today, I noticed that there are still lots of Holy Week patches, sashes, belts, and cushions for the backs of the necks of the guys who carry the pasos in store windows, but the bleachers and velvet curtains are all ready to go. Albert was hanging out taking some pics of the river. I walked down to meet him. I tried to catch a photo of one of the mom ducks with her ducklings while I was down there, but they never got close enough for a good shot. Tonight I finally downloaded the Semana Santa app. I have checked the schedules to make sure our airport bus will be able to get us to the airport for our trip on Wednesday and back home on Saturday...it looks optimistic, but having the app means we will be able to track the processions in real time. Ah technology. April 5 - Yikes is Winter Back?